This top has been a long time in the making, and I'm so happy to finally have it photographed so I can share it! 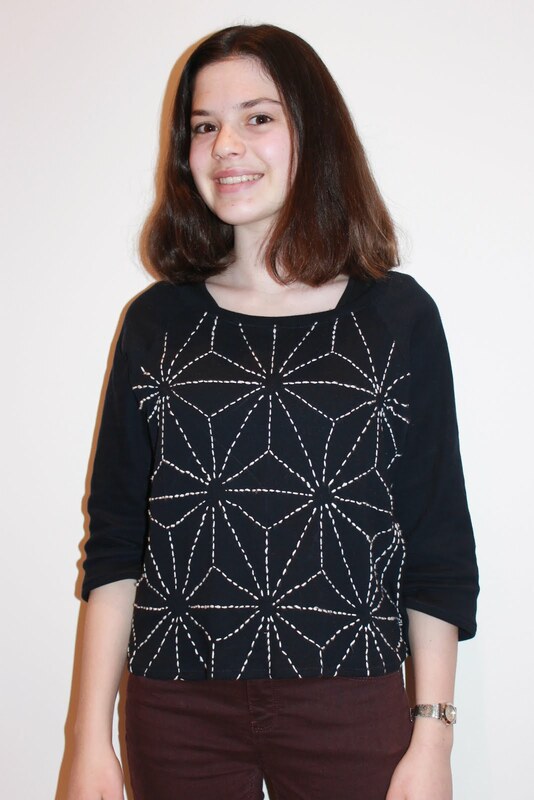 A while ago I discovered Sashiko, which is a Japanese sewing technique, and was completely intrigued with the intricacy and the beauty of the designs. There are lots of different videos and other information about it (I found this quite helpful), I would really recommend having a read about it as it's really interesting. I decided to embroider a Sashiko design onto blue jersey, as I really like the traditional navy and white design. Sashiko is supposed to be embroidered onto a woven fabric, and I did have a few difficulties at first using a stretchy fabric, but once I got used to it it really wasn't that difficult. I started this top in November, and sat doing the embroidery throughout November and December of last year. I like having something to do while watching television in the evenings, and this project (along with this one) was made by the lovely warm fires winter evenings! Before I drew on my design, I cut out the pattern pieces. I used my well-loved and used Linden sweatshirt pattern. I drew my design onto the front bodice using a chalk pen. Although it took a while to draw and much longer to stitch, but was definitely worth it! 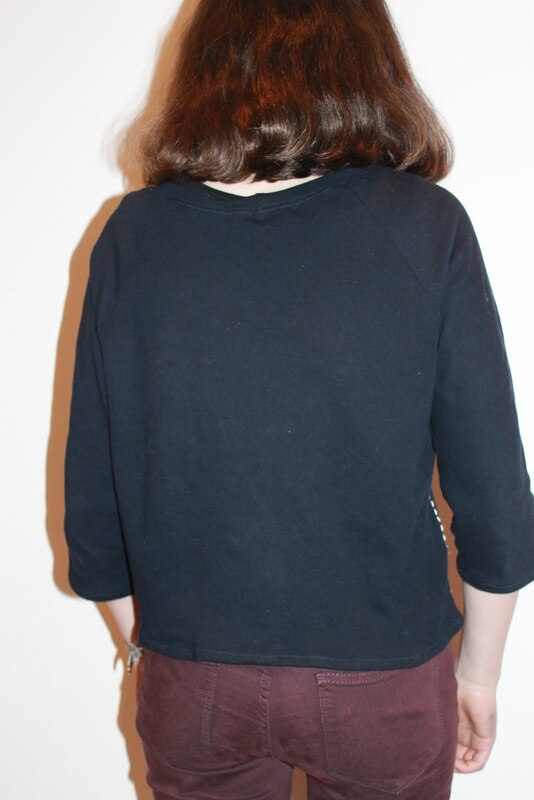 Once the design was all stitched, I sewed up the jumper as normal, which took about forty-five minutes - a shockingly short amount of time compared to how long the embroidery took! I really love the finished jumper. It was ready just in time for Christmas and I wore it with this skirt on Christmas day. The sleeves are 3/4 length, and it is cropped. I really like the length, although the fabric is quite thin so it can't be worn without a thermal underneath at this time of year! 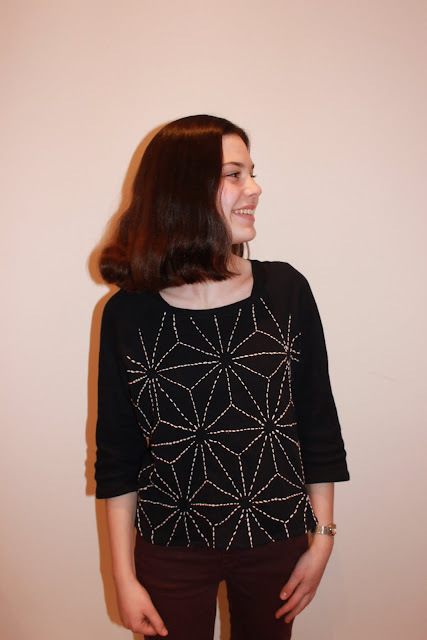 I have since seen this Linden hack which also has a little bit of Sashiko, and I now would love to make a jumper dress - although it might have to be a project for next Autumn now. I'm so pleased with this, it was a slight gamble as I've never done Sashiko before (and it's a lot of work for something that doesn't look good at the end!) but it was definitely a gamble that payed off. This is so beautiful!! I've never seen this done before. Wow! The Sashiko embroidery on this top is stunning! You did very well to persevere as it was so time consuming. I love the design you chose and what a great job you did with it! Such precision and patience...bravo! This is stop -on-the-street good. Just amazing. Pining this one. This is so beautiful! You really nailed it and it truly makes your jumper one of a kind. This is a stunning design and so neatly stitched! No matter what part of the stitching I look at, there is a beautiful geometric pattern to please my eye. I have been considering Sashiko for my last quilt, it is a beautiful type of embroidery.